This week an already roiling real estate market in Chicago's West Loop got hotter still. The latest entrant is a $400 million mixed-use tower designed by Goettsch Partners—a 350-room, four-star hotel beneath about 600,000 square feet of offices that will surely stoke the continued evolution of the area from post-industrial grittiness into a sleek, high-rent hub for technology companies and haute cuisine. 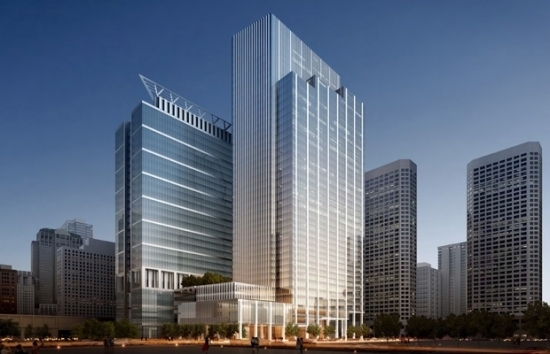 Crain's Chicago Business reported Florida-based developer Joseph Mizrachi will further thicken an already competitive field of downtown office space, building on his 2012 acquisition of a 1.1 million-square-foot office tower at 540 West Madison Street. His group, Third Millennium Partners, hopes to start work by mid-2015 on a 1.2 million-square-foot building just to the west, at 590 West Madison Street. Goettsch Partners' design is restrained, concealing its luxury hotel rooms and undoubtedly high-tech offices in tranquil planes of glass, scored with white mullions that stripe the building's bifurcated mass vertically. Because the foundation already was poured for the new building years ago when a second office tower was planned, the new tower can be built in as little as 20 months, giving Mizrachi's plan an advantage over some competitors, [J.F. McKinney & Associates Executive Vice President Mark] Gunderson said. Work could begin with as little as 200,000 square feet of office space leased in advance, he said. It also might compete by offering office rents slightly lower than its neighbors, which include 52 and 53 story towers from developers Hines Interests and John O'Donnell. The redevelopment of Indianapolis' Market Square area continues with the announcement that Deborah Berke Partners of New York City will work with locally based RATIO Architects on a 10-story office tower and “significant public green space” to replace a surface parking lot. In renderings released Wednesday, a slim, glassy tower hefts the bulk of its block-wide breadth southward, collecting sunlight as it reaches a low-rise mass around lush green space bordered by Market, Alabama, Washington, and New Jersey streets. Green roofs blanket both buildings, which will each have about 15,000 square feet of first-floor retail fronting onto a pedestrian plaza. The programs include a parking garage and conference center, as well as office space and retail. Columbus, Indiana–based Cummins makes and services natural gas engines and other fuel systems, employing about 48,000 people worldwide. 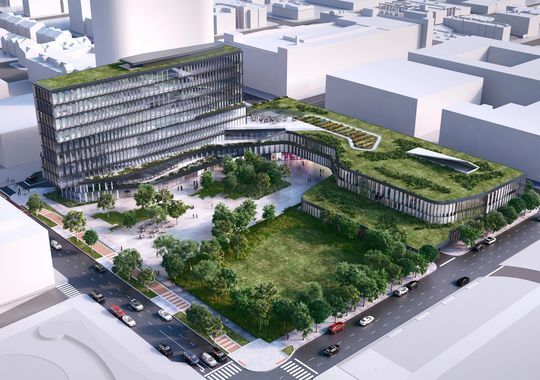 About 250 workers, including top executives, will move into the building immediately, reported the Indianapolis Star, assuming the plan passes a City-County Council vote that could come as early as December 17. Mayor Greg Ballard has already voiced support for the project, which he said in a statement “raises the bar for architecture in Indy and will stand as a bold and visually compelling gateway into the city.” The building's form, a kinked rectangular prism, is slightly stepped and shifted to maximize natural light inside the office tower. Black, rib-like mullions vary the facade's texture when viewed from an angle. Local architect Wil Marquez told the Star it represents "a new type of architecture for Indianapolis." “This is the new vocabulary in architecture, tying together buildings and green space,” Marquez said. Along with a 28-story residential tower planned across the street, a rebuilt plaza space nearby and a sleek, new $20 million transit center by the City-County Building, Cummins' plans represent somewhat of a rebirth for this long neglected corner of downtown Indianapolis. Deborah Berke Partners beat out New York colleagues SHoP Architects and Tod Williams Billie Tsien Architects for the job.